Streetwise Professor warns that clearing and collateral mandates create a ‘sort of liquidity death star’ because collateral-based funding (through repo markets) creates systemic liqudity vulnerabilities: margining leads to spikes in demand for liquidity, that in turn forces sales in illiquid markets, with further price volatility and margining. The mechanics of fire-sales and liquidity illusions are well known to regulators since Lehman (read Tarullo here), though the solution – clearing houses – doesn’t do away with the problem since it increase reliance on collateral sourced through repo markets. 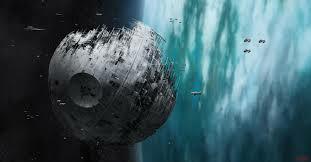 Central banks cannot fight the liquidity death star until they get off it. For a central bank to fight the liquidity death star, the Professor argues, it will need to ease collateral constraints by expanding the definition of ‘good’ collateral. This, of course, was the first measure that central banks across the world took after Lehman. But accepting ‘bad’ collateral won’t solve liquidity problems as long as central banks’ extraordinary lending relies on the same collateral practices that created (funding and market) liquidity problems in the first place. Since the late 1980s, central banks have increasingly used repos to implement monetary policy, lending against collateral instead of outright purchases of government bonds (the traditional form of open market operations). 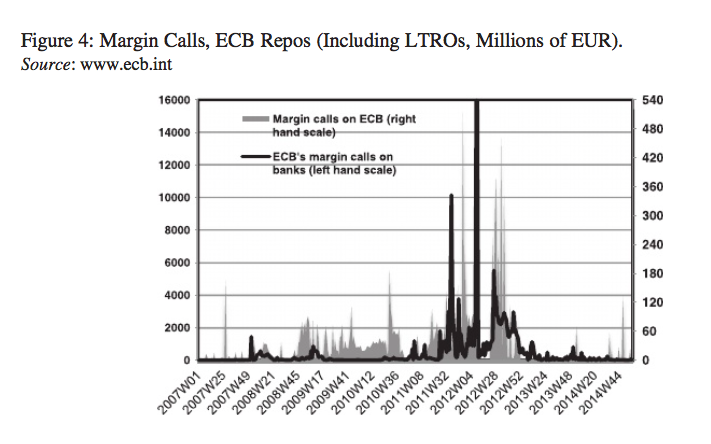 The turn to repos in monetary policy implementation prompted central banks to adopt the collateral risk management practices used by repo markets – the graph below shows that as the ECB took over from national central banks, it marked the beginning of a new regime for lender of last resort, where ECB marks collateral to market, and calls margin on a daily basis*. Consider this scenario. When liquidity demand spikes and collateral constraints tighten, financial institutions turn to central banks. As good lenders of last resort seeing the death star approaching, central banks lend against ‘bad’ collateral. But at the same time, to protect themselves against credit risk, central banks mark-to-market and call margin if that ‘bad’ collateral falls in market price. Central bank margining means that a financial institution borrowing from the central bank against bad collateral faces the same funding pressures that it would experience in private funding markets. This is exactly what happened to European banks during the sovereign debt crisis – with ECB making large margin calls at the height of the crisis in 2012. The traditional crisis intervention – providing banks with funding liquidity – becomes pro-cyclical. The money view – developed by Perry Mehrling and others – provides important insights. A crisis of market-based finance needs central banks to be much more than lender of last resort. As dealers, or market-makers of last resort, central banks need to support the monetary quality of collateral-based liabilities, that is, to support (collateral) market liquidity. This is what OMTs did in Europe. A much messier world of central banking, as Mario Draghi well knows. 2. The repo ‘paradox’ – the growing post crisis collateral-based regulatory regime has not been matched by significant regulation of repo markets. At global level, the FSB has watered down plans to impose minimum (through the cycle) haircuts on all collateral – including government bonds. Latest plans leave out repos between banks and repos with government collateral. There is little left after that. In Europe, the Commission and Parliament have finally agreed on transparency requirements for repo markets, without any structural regulations. With the Capital Markets Union plans in full swing, transparency is as far as Europe will go.